This is a very important part of playing the guitar and it is essential that you get it right from the start so that your playing can progress and you don’t find issues later. 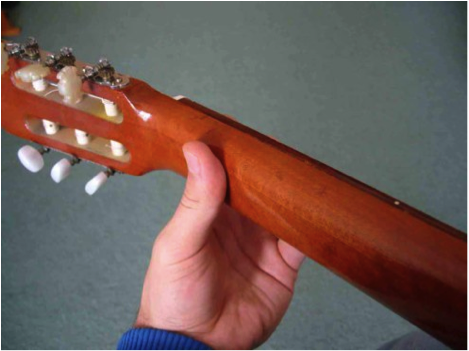 There are three main ways to hold the guitar neck. As you can see here the thumb is positioned on the back of the neck. This is a great position for people with smaller hands or players wanted to play larger stretches. Make sure that your wrist is not overly bent, only slightly bent in order for your fingers to curl around onto the strings. With this position the thumb is further around the fret board just resting on the edge and makes for the idea playing position for most styles and player levels. Again the wrist should only be slightly bent in this hand position, you may find this to be the optimal position for most playing. 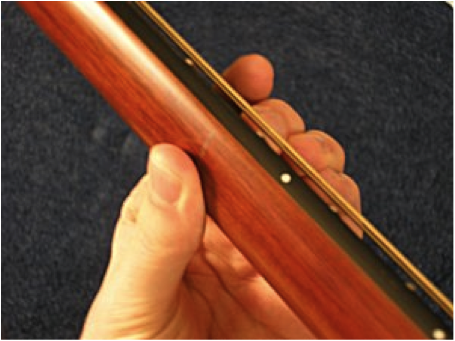 In this position we can see that the thumb has now come around the edge of the guitar neck and is touching the low E string. 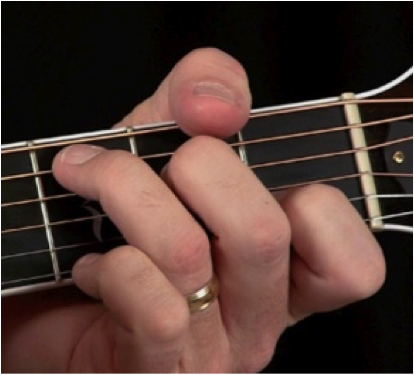 Although considered to be bad hand positioning this actually is an essential skill to have in order to play chords that involve notes on the low E string otherwise un- playable in an other way. In this position you will find the wrist to be at its least bent out of all the hand positions, however this position is the least versatile and will most likely only be used at certain times.